PODCAST 68 IS BETTER LATE THAN NEVER! 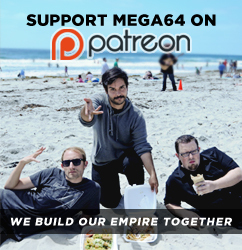 PLUS NEW MEGA64 SUMO AD! Yo, check out the new Podcast below, where we talk about the Wonders of Victorville and show you all there is to be seen in such an amazing town. We are at the home of our composer, Josh " Colorfinger" Jones, working on our top secret new episode "MEGA64!" Click here for the audio version. After you get your minds blown with that, watch our new MEGA64 SUMO ad. If this ad doesn't make you want to just give SUMO your credit card, then I don't know what will. That's all for now, with Rocco gone in Japan Derrick, and I are going to take it easy for a few days, but we'll be back for a Rocco free Podcast 69. A podcast without Rocco!? What are we going to do?! Find out next week, until then Subscribe to our RSS feed and get all the latest updates straight from Mega64.com!